The FDA Food Safety Modernization Act (FSMA) consists of seven new regulations. The key regulation around food transportation is the Sanitary Transportation of Human and Animal Food (sometimes referred to as SFTA – the Sanitary Food Transport Act), and is expected to be finalized on March 31, 2016. 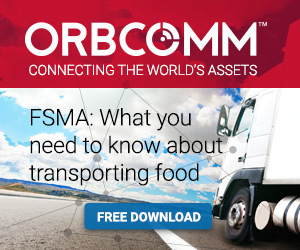 FSMA affects almost everyone involved in the United States food supply chain. 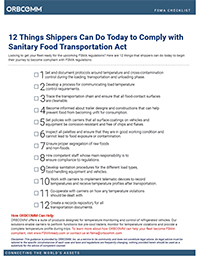 Any food transportation company with revenues over $500,000 that serves as, shipper, carrier or receiver must comply with the Sanitary Transport of Human and Animal Food (STHAF) rule. 1. Set and document protocols around temperature and cross-contamination control during the loading, transportation and unloading phase. 2. Develop a process for communicating load temperature control requirements. 3. Trace the transportation chain and ensure that all food-contact surfaces are cleanable. 4. Become informed about trailer designs and constructions that can help prevent food from becoming unfit for consumption. 5. Set policies with carriers that all surface coatings on vehicles and equipment be corrosion-resistant and free of chips and flakes.